I’ve been watching, taking pictures and watching some more to get a shot of the osprey chicks. Mostly, what I got was this. The Look! Are you lookin’ at me! Sitting on the poles eating fish. It’s all good fun but where are the chicks? What’s for lunch? Fish of course. Then yesterday a chick got high enough on the nest to get a shot. I have seen them through the nest since last week, but I couldn’t get a clear picture. Not the sharpest picture, but a start. It looked like she was feeding two, but I never got a look at another. 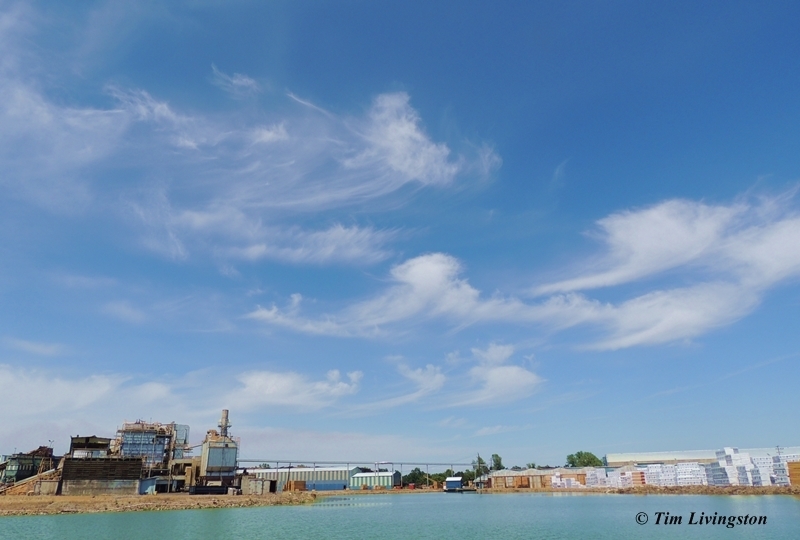 Blue skies from now on. 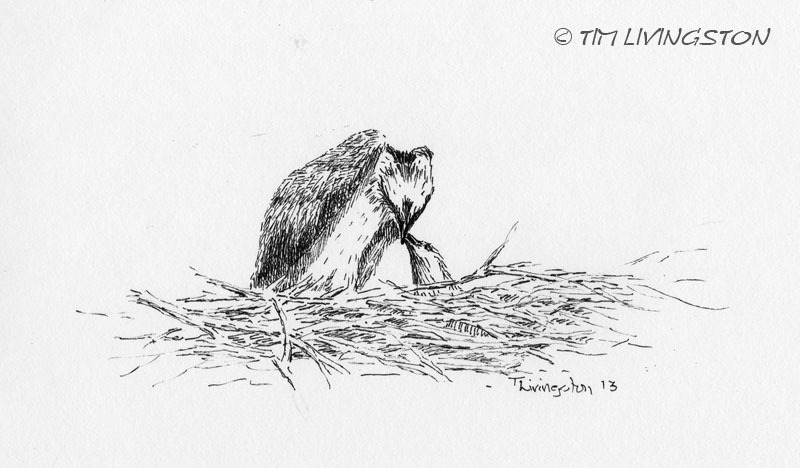 I was planning a sketch of the view through the nest from last week, since I couldn’t get a shot. This was the rendition I was planning. A quick and dirty sketch of the scene with a few less sticks. This is also my Thursday drawing for Z’s challenge for art at Zeebra Design. This entry was posted in Drawing, Pen and Ink, Wildlife, Wildlife At The Mill and tagged art, artist, drawing, fish, fishing, nature, osprey, pen and ink, photography, wildlife by foresterartist. Bookmark the permalink. Gorgeous photographs and I love the sketch too! Fantastic. I especially like the high voltage photo. 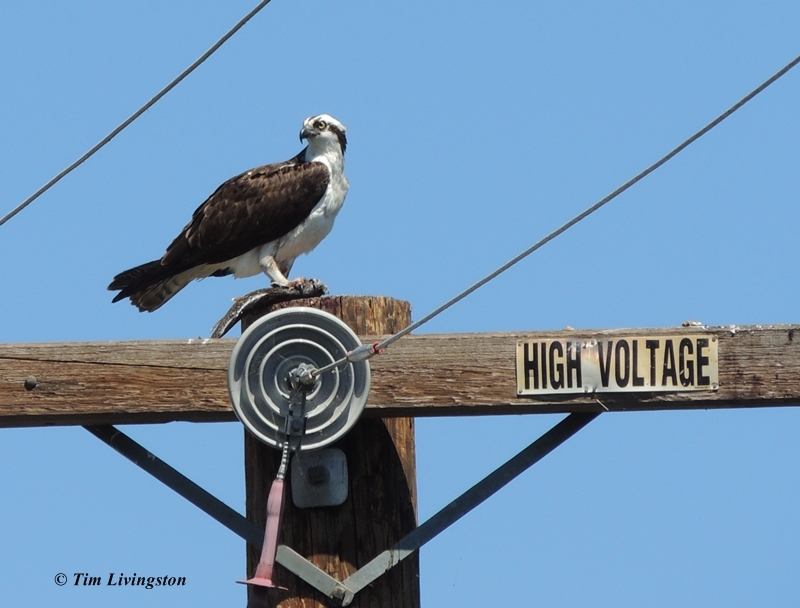 I think he likes to pose next to the “High Voltage” sign, because it’s cool! OH Baby Osprey ! that’s so good to see Tim after what feels along time somehow .. I love your drawing … such a nice moment you’ve chosen to portray . Thank you Poppy. Hopefully, I will see a lot more of the chicks now. 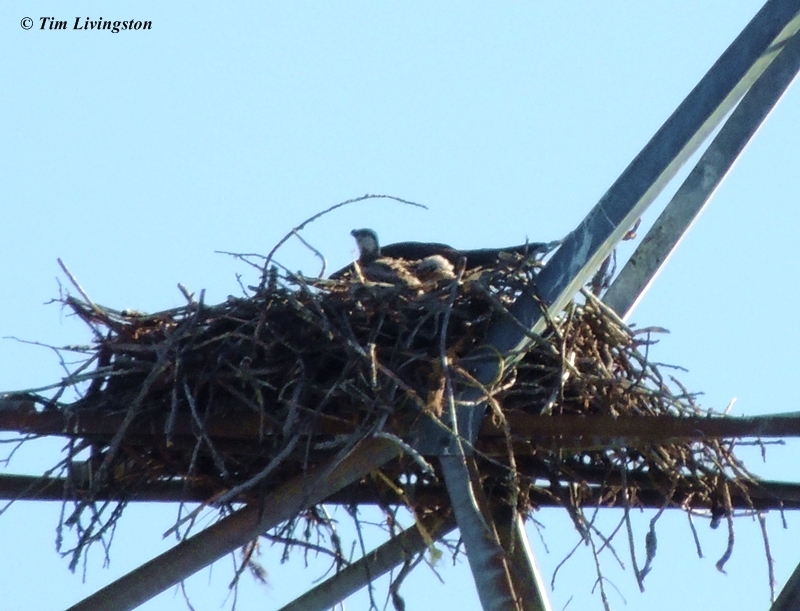 Great to see the osprey family doing so well and love your sketch, hope you keep us updated as the chicks fledge? Thanks Mike. I plan to follow them all the way through. Great shots! When I lived in Florida, I would see an osprey pair that nested in a street sign. They finally did have chicks, but they were hard to see until they finally started flying. A street sign. I love that. I’ve taken a lot of pictures of many of the nests around here and they are quite creative where they will put them, but I have never seen one in a street sign. Thanks Scott, hopefully I will get some good “chick pics” in the future! Your pictures are great, but your artwork is exceptional. It has the feeling that art is supposed to convey. Thanks Z. Last night it was after 9pm (bedtime) when I sat down draw. I had just fed the dogs and let them out for them out for their post dinner airing out. I got everything ready when Teka barked that she was ready to come back in. When I opened the door I was greeted by the staggering aroma of “Ode de Skunk.” Finally, after bathing two dogs with Mary’s help I finished my sketch in bed. I almost didn’t make the Thursday deadline. oh wow! i have a great skunk story as well, but it’s time for me to leave to meet the group! i hope that you’ve purged the dog and home of the aroma of skunk!!! thanks for your dedication to the drawing!!! Fortunately, they were only misted. We were able to de-stink them very effectively. Great pictures. I bet patience is required! Love the artwork even more. Thank you Susan. I really don’t get to sit and watch them. However, I come and go a lot, so I check them when I do. Mostly, it is lucky timing and being observant. Really nice photo. I can see you will sketch this one up for sure. It says a lot! I think this is a very nice fellow and I love this baby.. Wonderful pictures and sketch, Tim. A great portrait of that bird, Tim. And it must be fascination to have these big birds around. Thanks Bente, it is fun to get to watch them each day. Beautiful. Thanks for sharing this post! I just discovered this post of yours. Wow! That close-up is amazing. I went kayaking on a lake a few days ago and there were Ospreys flying all over the place. I probably saw a dozen. I was snapping photographs like crazy, but never got anything even a tenth as awesome as your photograph. Good job! I love “The Look”. 🙂 One of our cats has a very similar Look. You sure don’t want to mess with them when they give you that look! Check them out. I’ll bet you could send your pics to them and they’d post them for their readers! Fantastic that you have such a front-seat view! I envy this! Great pic and art, too. 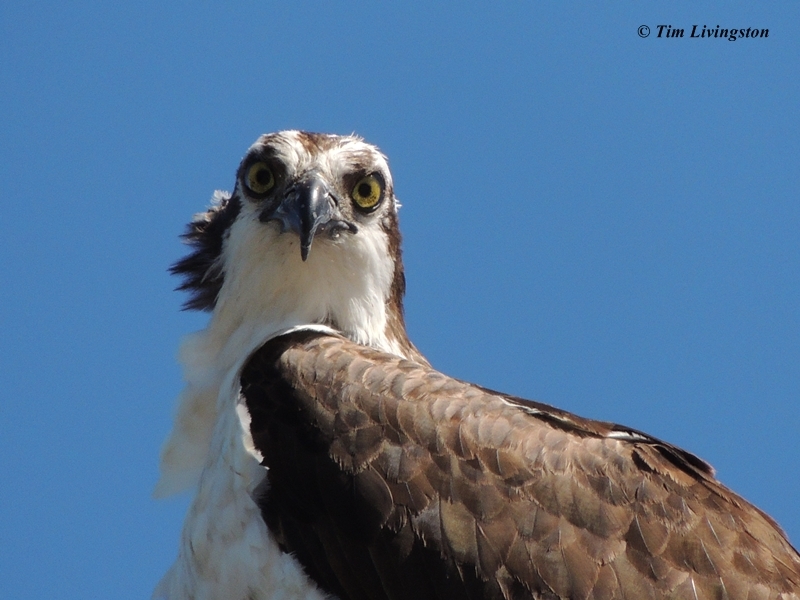 Ospreys can definitely give you a piercing glare!! You know you are in their sights! !